Celestite is made up of strontium sulfate. The chemical formula is SrSO4. Also known as Celestine this mineral forms orthorhombic tabular crystals, granular and fibrous masses. Its name comes from Latin, caelestis meaning celestial. 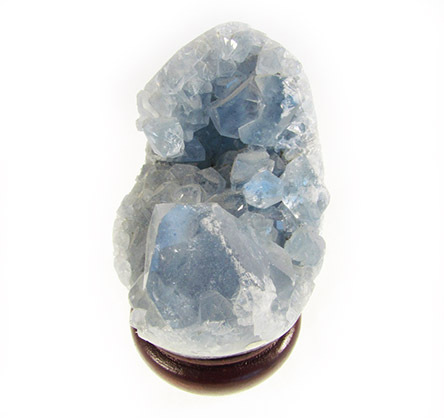 The gentle blue color suggests a heavenly nature for this crystal. It can also be colorless, white, and yellowish with a white streak. Celestine is a soft mineral 3 to 3.5 on the Mohs scale. It is transparent to translucent with a vitreous or glassy luster. It is found predominately in sedimentary rocks and is associated with gypsum, halite and anhydrite. It is used in the manufacture of glass and caustic soda. Some of the best crystals come from the Sakoany Mine in Madagascar. Sulfur deposits in Poland and Italy also produce beautiful crystals.In North America celestite is found in California, Mexico, and South Bass Island in Lake Erie which is home to the largest known celestite geode at 35 feet across.